Recently a friend of mine complained to me about how he screwed up finding a beach volleyball net to set up in a Berlin park. They have a big sandbox there for playing beach volleyball, so everybody can bring their own net and start playing. My friend obviously tried to set up several volleyball sets including net but wasn’t satisfied with any of them. That’s when I started doing some investigating. If you have ever tried to find a good portable beach volleyball set, you might also have realized that this can be quite a tricky task. Some of the sets that can be found include a net that is not height-adjustable and you have to stick to one height without being able to play men, mixed or women’s height. Some of the sets come with poles that that are not suited for the beach because you cannot fix them in the sand. They are for backyards only. And some of the sets come with tape that has the size of a volleyball court but is too big for beach volleyball court size. How does a good beach volleyball set look like? 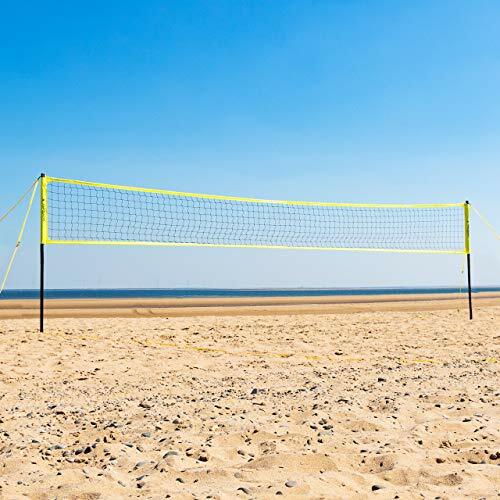 Since the whole task can be quite annoying, we have found a beach volleyball set for you that can be adjusted to the right height, can be easily set up at the beach and comes with tape to exactly build a beach volleyball court. The VERMONT PORTABLE BEACH VOLLEYBALL SET PRO is a complete beach volleyball set adhering to FIVB standards. I will tell you in a minute why it is so practical and therefore the best volleyball set we could find. Vermont is a brand of British Net World Sports which offers a huge portfolio of sports equipment and is well known for their great customer service. Their beach volleyball set comes with a 28ft volleyball net, professional telescopic posts and a heavy-duty carry bag for easy transport. The aluminum telescopic posts can be set up to play on three different heights: 8ft for men, 7ft 8” for mixed and 7ft 4” for women. We did especially like the blue tape which makes it easy to mark out an official size beach volleyball court. We found the tape to be fairly visible which made it easy to decide if spikes were in or out. Besides adhering to official standards, the most important criteria for a beach volleyball set is stability. With the sand anchor kit, we found the whole set-up to be very stable. Due to the diameter pole plates, the telescopic posts can sit on top of the sand without sinking. Even hard-driven balls into the net didn’t cause the net to slack or even fall. Moreover, setting it up was a piece of cake. With two persons doing the work, we managed to set everything up in less than 10 minutes. After your day at the beach, you can disassemble everything quickly and then use the carry bag to transport the set. The weight of the overall set is about 25 pounds which is not lightweight but still acceptable. If you are looking for a volleyball set for the backyard, this is not the right option for you. The sand anchors are made for the beach and you will have a hard time setting it up on a hard surface. If looking for a volleyball set, check out this option. And moreover, this high-quality set comes at a price. We still find it to be good value for money though. And if you are aiming at serious beach volleyball or even competitive play, you will probably need to make an investment anyway. We have tried some other products including the Park & Sun Sports Tournament Flex 1000 Outdoor Volleyball Net System and the Baden Champions Series Volleyball Set. 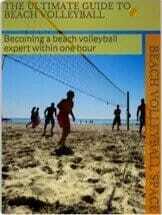 Both sets failed either in adhering to beach volleyball standards or providing sufficient stability on sand. So if you wanna check out the Vermont product features and prices, go here. Can this net be easily set up on both sand and grass? Or do you have to order a separate set to be able to play on grass? good question, perhaps we haven’t made it clear enough. There are two versions of the net. The one we have reviewed is for playing on sand. It is not suitable for hard surfaces like grass. If you want to play on grass, we recommend to get the other version for hard surfaces.